Heat closed medium-size contact grill for 5 minutes. Sprinkle chicken with seasoning blend. Place chicken on grill. Close grill; cook 4 to 5 minutes or until juice of chicken is clear when center of thickest part is cut (170°F). Meanwhile, in small bowl, mix mayonnaise, vinegar and garlic powder. Spread on English muffin halves. 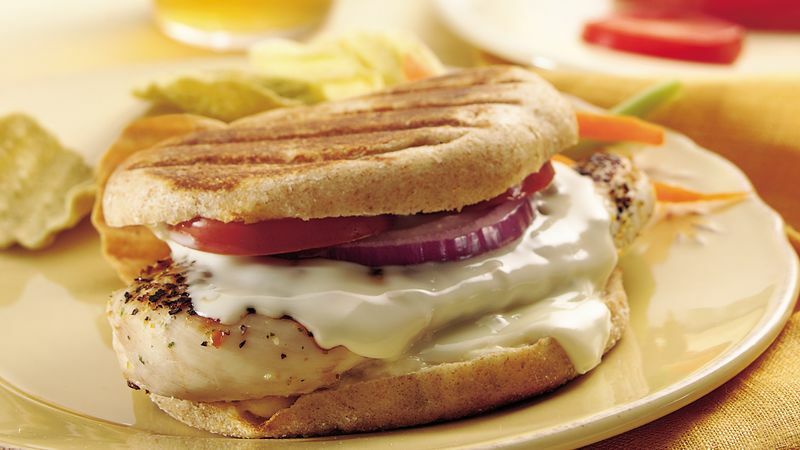 Place chicken on bottoms of English muffins. Top with cheese, onion, tomato and tops of muffins. Place sandwiches on grill. Close grill, pressing to flatten sandwiches; cook 2 to 3 minutes or until sandwiches are toasted. Regular tomatoes can be substituted for the plum tomatoes but may add more moisture to the sandwiches during grilling. Try this with other types of cheese, such as reduced-fat Swiss, provolone or Cheddar.